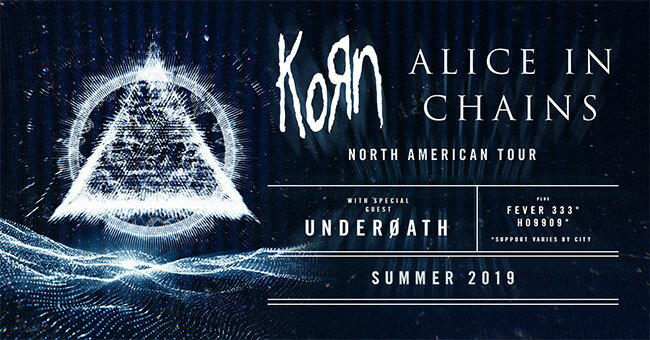 Hard rock legends Korn and Alice in Chains have announced an epic co-headline amphitheater tour across North America this summer. Underoath will join as special guest on all dates, with Ho99o9 and FEVER 333 opening on select dates. Produced by Live Nation, the 30 city outing will kick off July 18th in Del Valle, TX at Austin360 Amphitheatre and make stops in Dallas, Nashville, Toronto, Denver and more before wrapping September 4th in Mountain View, CA at Shoreline Amphitheatre. Tickets go on sale to the general public beginning Friday, March 1st at 10 am local time at LiveNation.com. Citi is the official pre-sale credit card for the tour. As such, Citi cardmembers will have access to purchase pr-esale tickets beginning Tuesday, February 26th at 10 am local time until Thursday, February 28th at 10 pm local time through Citi’s Private Pass program. Since forming, Korn has sold nearly 40 million albums, collected two GRAMMYS, toured the world countless times, and set many records in the process that will likely never be surpassed. Vocalist Jonathan Davis, guitarists James “Munky” Shaffer and Brian “Head” Welch, bassist Reginald “Fieldy” Arvizu, and drummer Ray Luzier, have continued to push the limits of the rock, alternative and metal genres, while remaining a pillar of influence for legions of fans and generations of artists around the globe. Korn’s most recent LP, 2016’s The Serenity of Suffering, built upon the band’s remarkable history with a return to the dual-guitar dynamic that first fueled their music, and earned the group their tenth GRAMMY nomination. Korn are currently in the studio finishing up work on their widely anticipated follow-up to The Serenity of Suffering, which will be released later this year. Seminal rock band Alice in Chains are touring in support of Rainier Fog, which hit No. 1 across Billboard’s Rock, Alternative and Hard Music Charts and No. 1 on the iTunes Rock Album Chart and earned them a Grammy nod for “Best Rock Album.” Over the course of their remarkable career, Alice in Chains (vocalist/guitarist Jerry Cantrell, drummer Sean Kinney, bassist Mike Inez and vocalist/guitarist William DuVall) have garnered multiple Grammy nominations, sold more than 30 million albums worldwide, and amassed a diehard international fanbase whose members number in the millions. Their discography features some of the biggest and most important albums in rock history, including 1992’s quadruple-platinum-certified Dirt, 1994’s triple-platinum-certified EP Jar of Flies, which was the first EP in music history to debut at No. 1 on the Billboard Top 200 and 1995’s self-titled double-platinum-certified Alice in Chains, which also entered the Billboard Top 200 at No. 1. They returned in grand style in 2009 with the critically acclaimed Black Gives Way to Blue, which hit No. 1 across the rock and alternative charts, earned a Grammy nomination, was certified Gold and hailed by Vice as “a record that’s as powerful as anything the band has done.” Alice in Chains remains one of the most successful and influential American rock bands of all time.